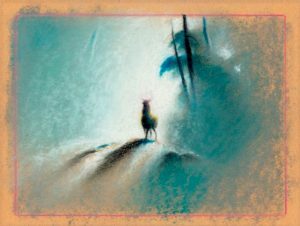 A painter, lithographer, and kite maker, Wong got a job in 1938 with Disney Studios, just as the company was gearing up to make Bambi. Wong was just a sketch artist — an “in-betweener” who filled in some of the side art that the main animators did. Those animators, meanwhile, were struggling to come up with a “look” for the movie. The animals were lost in the detail of the realistic forest design they had come up with. “Too much detail,” he thought at the time. With his Chinese background, Wong envisioned a more impressionist style, and whipped up some sketches and watercolors on his own time to “create the atmosphere, the feeling of the forest.” In school, especially studying Chinese and Japanese brush work, “I learned that nature is always greater than man. It is the balance and harmony between man and nature that is important.” When the animation director saw what Wong came up with, “He said, ‘Maybe we put you in the wrong department.’” Wong was made art director for the film. One of Wong’s Bambi sketches. “Tyrus Wong really made that film look the way it did,” says Andreas Deja, the artist behind Lilo of Disney’s Lilo and Stitch and Jafar in Aladdin. “There was something about the way the forest was depicted that had a layer of magic to it.” Walt Disney declared Bambi was his favorite of the studio’s animated films. Wong lost his job in 1941, during a strike, but was quickly picked up by the Warner Bros. studio, where he drew storyboards and designed sets. He retired from Warner in 1968, and spent his retirement years painting, illustrating Christmas cards, and making and flying kites. “You get a certain satisfaction in making them, and you get a certain satisfaction flying them,” he said. “I used to go fishing a lot, and I love fishing. This is just like fishing, except in fishing you look down. Kite flying, you look up.” Wong died at home on December 30. He was 106 years old.